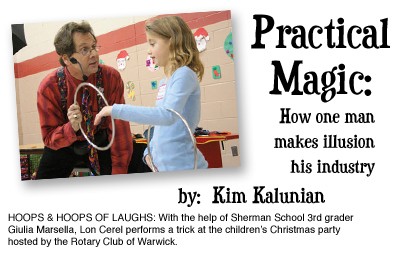 What kind of magic does local magician Lon Cerel do? "Have you ever heard of David Copperfield? What about Siegfried and Roy? Well, I'm not as good as those guys, but I'm more affordable and more available!" That's Lon Cerel in a nutshell: quick, funny and of course, magical. Cerel has been performing since the age of 11, starting with children's birthday parties, which he still does. He admits he has always had a love for children, which is why he decided to be a pre-med student at Providence College. "I wanted to be a pediatrician," he says, but after graduating in 1978, he returned to his passion of magic and never looked back. "Anyone want to buy a degree in biology?" he asks, laughing. Although he would have loved to help children by being a pediatrician, Cerel recognizes the joy he brings to children through his magic. "Instead of making children smile one at a time, I get to make the smiles appear in groups." Cerel says that 60 percent of his work is still with children. One program that he is particularly proud to be involved with is called "The Magic of Reading," which he, his wife and a friend created. The program is geared toward children in Kindergarten through fifth grade, and uses popular children's books and magic techniques to promote recreational reading and good values. "The program teaches elementary students to turn on their imagination through books," explains Cerel. "They learn that they can go anywhere they want to go by reading a book." Cerel says that when he works with children, he likes to make them think outside of the box, like magicians do. "I ask them if practice makes perfect. They always respond 'yes' but I tell them, 'No, perfect practice makes perfect,'" Cerel says, explaining how he teaches children to practice perfectly, for if you practice something the wrong way, you will just instill a bad habit. Cerel's technique of perfect practice has yielded him a career he loves and a place in the Guinness Book of World Records. Cerel currently holds the unchallenged record for sculpting a balloon dog, more specifically, a French Poodle. Before Lon, Windy The Balloon-a-tic, a good friend of Cerel's, held the record for fastest balloon sculpture. The two men decided to create a feud in the trade papers, challenging each other to a "Blow Off" to see if Windy could defend his record against Lon. The two men gathered at the Three County Fair in Northampton, Mass. in 1982 with Guinness World Record representatives officiating the event. The two men were timed to see how long it would take for them to blow up the balloon, tie it and twist it into the poodle shape. Lon came out victorious, beating Windy's record with a time of 2.98 seconds. Cerel has even recently written a book on the subject of balloon sculpture entitled "How to Blow Up Animals: A Beginner's Guide to Fun With Balloons," which is now available on Amazon.com. The foreword to the book was written by Cerel's good friend and mentor, Henny Youngman, with whom Lon toured as an opening act. Youngman was a British-born comedian and violinist, whom Cerel admits he draws a lot of his performance style from. "I used to watch the comedians and magicians on Ed Sullivan, the old school guys like Alan King and Henny Youngman. I use the same shotgun theory of comedy. I throw a lot out there." When Cerel was younger, his parents took him to the Concord Hotel in the Catskills to see one of his favorite performers, Shecky Greene, who was headlining there amongst other big names like Ethel Merman, Bob Hope and Buddy Hackett. Greene was a comedian and nightclub performer who headlined in Vegas for 30 years. Soon after Cerel saw him in the Catskills, Greene announced his retirement, which Cerel described as a major disappointment. Later in life, Cerel discovered an e-mail address for his idol, Greene, and decided to send him a message on a whim. The next day Greene had left Cerel a voicemail. "He said 'Thanks for the note, it is so nice to be remembered,'" explained Cerel. But Lon was much more excited about another result of Shecky's call: "I got his number on caller I.D.!" Cerel's return call to Shecky Greene resulted in a friendship that lasted through the years. Most recently Lon was personally invited to see Shecky perform in Las Vegas for a sold out audience. "He's an American treasure, a comedy icon. He's been in the business for over 60 years," says Cerel. Lon, who has been in the magic business for over 30 years, says that success takes a lot of hard work. "Luck is when opportunity meets ability," says Lon, "I'm an overnight success - after 40 years in the business!" Of course, Cerel loves what he does, but there have been bumps in the road. Sometimes things get stale when you do so many similar shows over and over, he says. But a recent battle with cancer helped Lon to rediscover his passion for his career. Come February, Cerel will be a four-year cancer survivor. Back when he was diagnosed, Lon did not let the news bring him down. "It was a speed bump. I knew it would be a 'yusta.' You know, I 'yusta' have cancer." Cerel underwent six months of chemotherapy and surgery, and after five weeks of recovery was back on the stage performing. Immediately, the thrill of being on stage was renewed to him. "I was like a child discovering magic all over again," he says. Now Lon takes part in Relay for Life, on the team Raging Through The Ages. He also devotes time to The American Cancer Society to spread awareness about the disease. In his downtime, Cerel enjoys reading about the history of show business. "As much as I enjoy working, I need a hobby. After all," he says with a smirk, "I'm self-employed and I hate my boss." Cerel has collected books and artifacts from the glory days of show business. He even has original letters from Harry Houdini, Florenz Ziegfeld and P.T. Barnum. Cerel's connection to Houdini doesn't stop with his letters. Back in 1976 Cerel hung upside-down in a straight jacket over the Providence River as part of the South Main Street Harvest Festival. Almost 50 years prior, to the exact week, Harry Houdini performed the same stunt in the same spot. Lon was even taught the straightjacket escape by an associate of Houdini's. When asked if he would perform a stunt like that again, he replied: "I'm older and smarter, plus the city of Providence moved the river, so probably not." For now, Lon sticks to simpler illusions that keep audiences amazed. Cerel described his magic style as Òtwistedm,Ó a combination of comedy and magic curve balls, all twisted into one. "I'm off the wall, and I'm not for everybody. If you try to get everyone to like you, you're going to be so bland that no one will like you," he explains. But Cerel is an entertainer, and his audiences like him plenty, especially the kids he so often performs for. For Cerel, entertaining children and watching their amazement is always gratifying. "The kids will find the magic exciting and colorful. They'll witness the impossible." So, does Lon Cerel, the man who performs these impossible feats of illusion, believe in magic himself? His answer is simple: "To get up every day and be able to do what I do...that's magic."